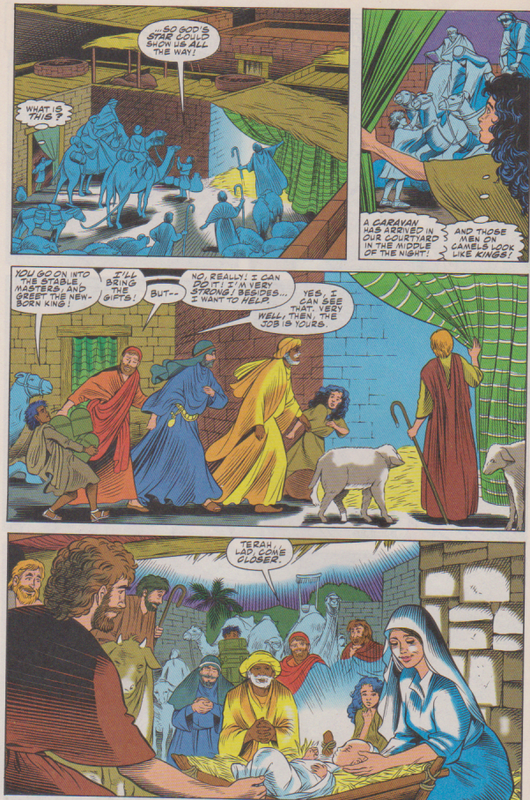 A few months ago, I came across this comic 'The Life of Christ: The Christmas Story' as I was searching for things to review for the Holiday Season, and I figure it would be interesting to see how much of the original story Marvel was able to adapt to a 32-page comic. I am going to Hell, Michigan for that aren’t I? 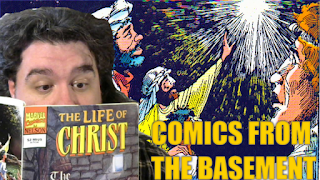 Anyway, I promise this episode will not get too involved in the religious aspect of things, because I’m sure as hell not qualified to tackle such manners, however I will be reviewing this comic: The Life of Christ: The Christmas Story’ published by Marvel Comics with the cover date of February 1993, but was probably released in December of 1992. Yeah I know, I’m adding these to my reading list for 2017! But that aside, let’s get down to business... The Life of Christ: The Christmas Story is indeed just that, a straight up adaption of the story of Jesus’s birth told in a straight forward style. 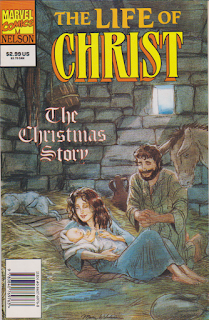 The writer tasked with the tale was Louise Simonson whose worked history actually included another ‘Life of Christ’ story in 1990, ‘The Easter Story’ so got to give Marvel credit for going with someone who was up to the task of staying on course with the source material while giving it enough slightly different wording to make it work for a comic book. Her other credits include work on Power Pack, New Mutants, Red Sonja, Sensational She-Hulk Superman: The Man of Steel, Steel, New Titans... to say she has ‘comic book street cred’ is an understatement. 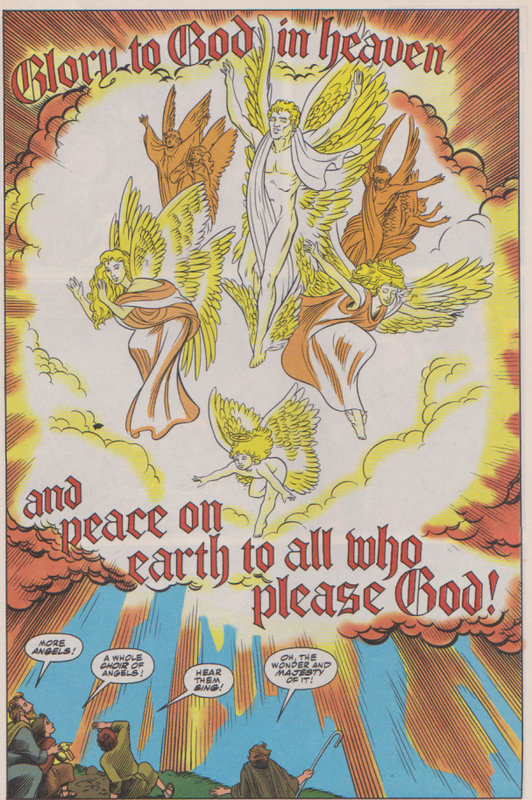 Which come to think of it, since that was published in 1990... that makes this comic a prequel. 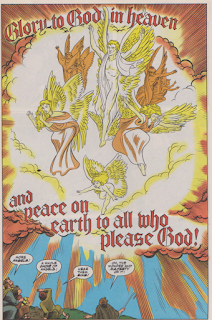 Now as for why the comic was made, well other than it being for the Christmas season and wanting to present something other than Santa, I don’t have a flipping clue, but this was published under Tom DeFalco’s run as Editor in Chief at Marvel, a period of time that saw Marvel so a 500% rise in net profits, so okay’ing a book like this probably seemed like a safe call to make. So that all said, let’s get to the story of this comic. 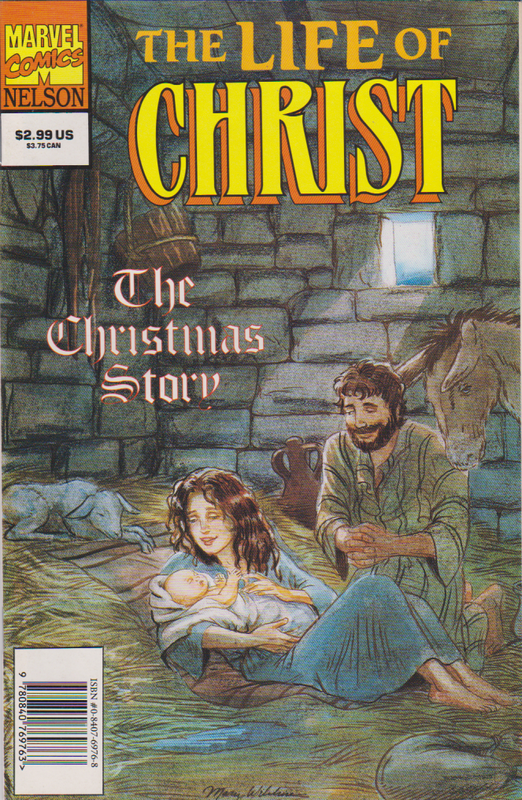 The cover is about as symbolic as possible, clearly it the stable just after the Baby Jesus was born in Mary’s arms with Joseph kneeling nearby as light is shining through a window. It’s nice, simple and basic. The only nitpick where ‘The Christmas Story’ is written, as I think it would look better under the comic title in a small font in one line so it does take away from the image. 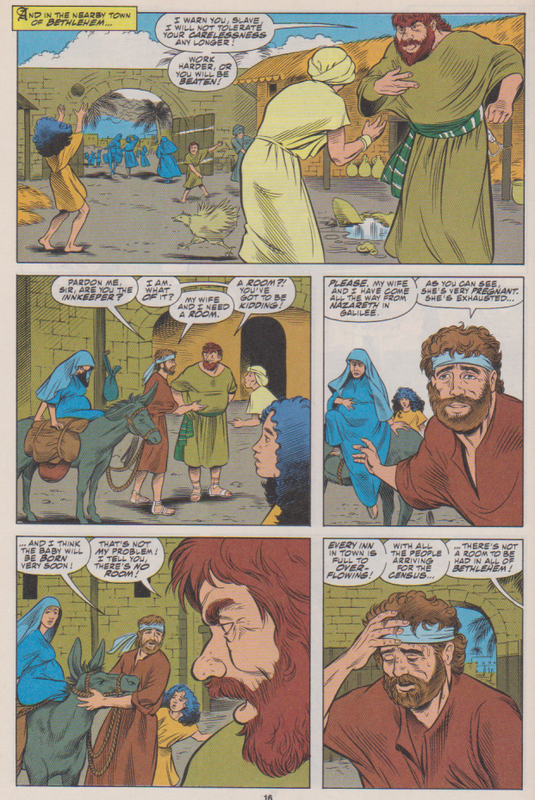 Now how much of the story actually got adapated for the comic... this is gonna be a lot of summarizing folks....The comic itself opens in the hills of Judea, Zechariah is on his way to light incense at the temple, and reflecting on how for many years he and his wife Elizabeth wanted to have a child. He is visited by an angel, Gabriel, telling him that he and his wife will have son and that he will be named John and is destined for many great things. Zachariah has doubts, so Gabriel says he won’t be able to speak until everything he said came to pass. Back with the three wise men, they arrive in Jerusalem and brought before Kin Herod with news of a newborn king... and of course Herod doesn’t take this too well, after meeting with the wisemen he asks them to tell him of where the ‘true king’ is so he can worship him. 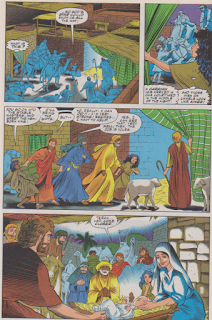 Joseph and Mary arrive in Bethlehem but there is a problem there are no rooms left with all the people arriving for the census, the town is packed, and with Mary being pregnant and both being tired from the journey things appear hopeless. A girl named Rifka notices the situation and much to her brother’s dismay, she tells them they can stay in the stable... and that night Jesus is born... and up in the hills Gabriel is out to bring to news with a chorus of other angels to a few shepherds who along with there flock head on down to search for the new born king, they meet up with the three wise men and they of course find the stable where Joseph, Mary and the Baby are staying. The gifts are presented and Jesus gets a royal welcoming, with Terah giving his flute to the babe as symbol of giving all of his treasure to him, Rifka witnesses this and wants to give a gift herself. Which turns out to be two turtle doves. The Three Wise men and Terah depart, getting a vision grom Gabriel not to head back to King Herod, Jesus is circumcised and a month later Joseph Mary and their baby prepare to head back home, along the way Gabriel drops in warning them that King Herod is looking for the baby and intends to kill him and to flee to Egypt, but when Herod is dead, Gabriel gives them the okay to then head back to home. Verdict: As you can tell with the summary, the story is basically taken verbatim from the Bible with all the major plot elements that the story of Jesus’s birth being touched on in some way with the 32 pages. Even with no advertisements, that’s still not a lot of room to try and get everything in there. 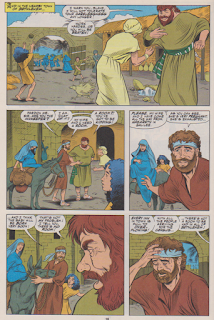 One thing that works to the comic’s advantage is the use of thought balloons, particularly with Joseph early on and the doubts he has when he hears the news from Mary. The artwork is clear cut and basic, perfectly filling in the details of the story visually. Since there are very few text boxes other than to detail how much time has passed or where a part of the story is taken place. 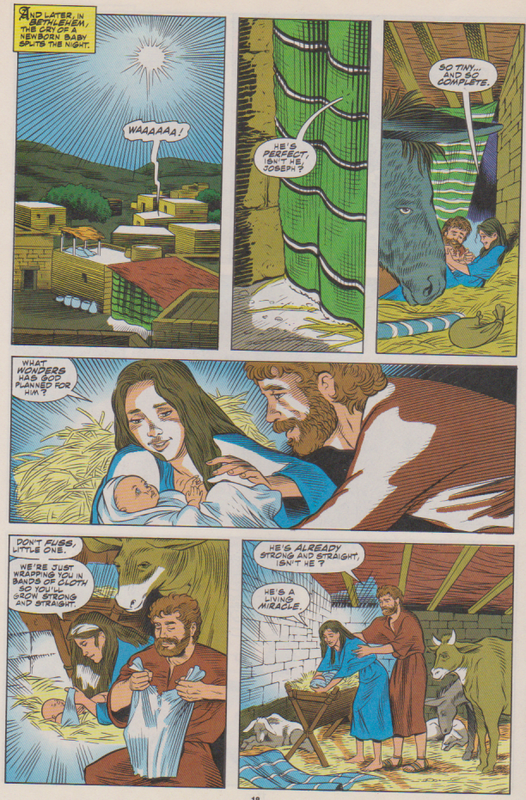 This comic is what it states, it is the Christmas Story in comic book form and is certainly a nice piece for my collection, even though I’m not religious. 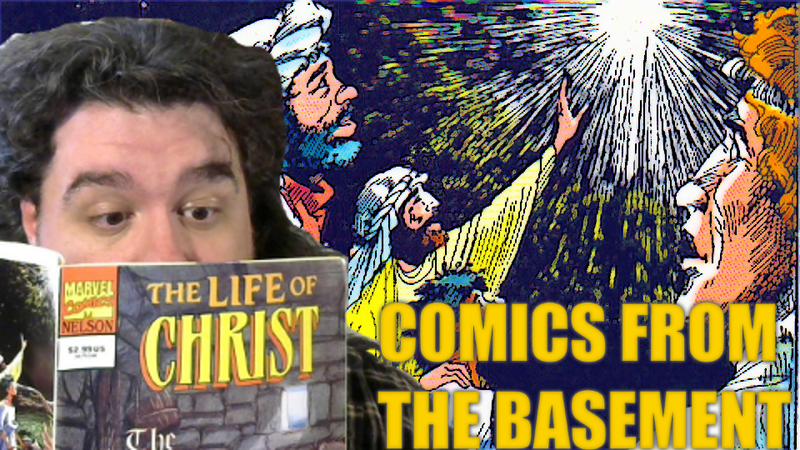 And since I’m now away of the Easter comic, I think I’ll track that down for the week of Easter Sunday.